Charcoal grills are designed for fast open flame cooking with direct heat. They are not ideal for the low and slow barbecue style that you would use to cook ribs and other tougher cuts of meat. Smokers are designed to keep a low and stable temperature. Despite the fact that smoking is not their intended use, charcoal grills can be adapted easily to smoke meats. In fact, the ribs they produce can be almost as tasty and flavorful as those made in a conventional smoker. Below are some tips on how to get flavorful and tender ribs on your charcoal grill. One of the big issues that you will face when smoking ribs in a charcoal grill is the limited space. You will have to make sure that all of your ribs can fit on your grill. If you are using the 2-zone method described below, you need to have enough space that you can fit all of the ribs on one side. Of course, you may have trouble getting a long rack or multiple racks to fit on a small grill. 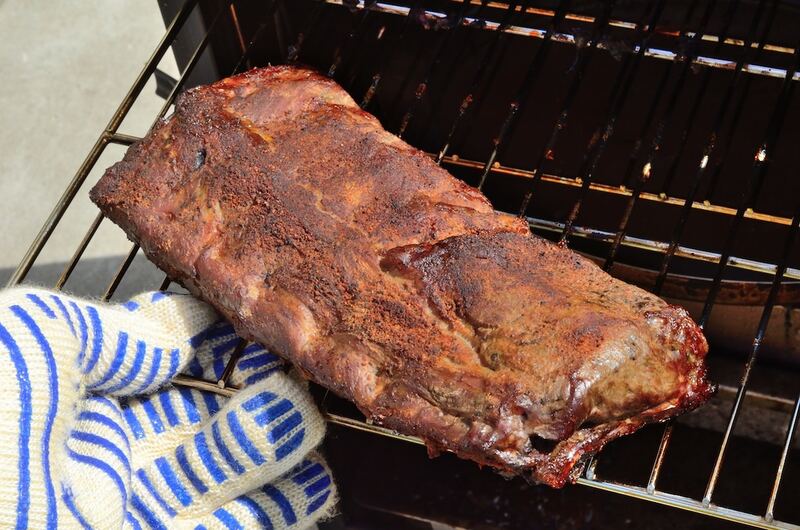 Your best option is to invest in a rib holder that can keep the racks of ribs positioned vertically while they smoke. This can double the number of rib racks that you can smoke simultaneously. If they are upright, you can even bend them slightly to fit the contours of your grill. The secret of good smoked barbecue is precise heat control. Simply using a low temperature is not enough. You need to keep it consistent and high enough to cook the meat, but not too quickly. Too high and you run the risk of charring or overcooking. Too low and the center will remain uncooked. You want a moderately low heat that will break down the connective tissue in your ribs over a long period. In addition, the longer your ribs are bathed in smoke, the more of its flavor they can absorb. How much oxygen your coals get will determine how quickly and how hot they burn, which means that they will also determine the temperature of the cooking chamber. You control the air that gets to the burning coals with your grill’s vents. Most modern models come with adjustable vents in the lid of the grill or on the side. Some models will come with a chimney that you can open or close and which serves the same purpose. With the vent all the way open, the coals will burn hot for a shorter time. With them closed, the coals will burn more slowly, allowing you to lower the temperature inside the grill. In a truly airtight model, you may even be able to smother the coals by closing the vents all the way. Over time and by experimenting with your grill, you should be able to find the right amount of air for ensuring that your ribs smoke at a specific temperature. You can use hot and cool zones to ensure that your meat cooks slowly. Create a hot zone by moving all of your coals to one side of the grill and heaping them. You will leave the other side empty. You can then sear your meat quickly over the hot side and leave it to smoke for a longer period on the cool side.